Whitelaw Towers: CFMEU Thugs Charged Over Assault on Golden Dawn Supporters. CFMEU Thugs Charged Over Assault on Golden Dawn Supporters. 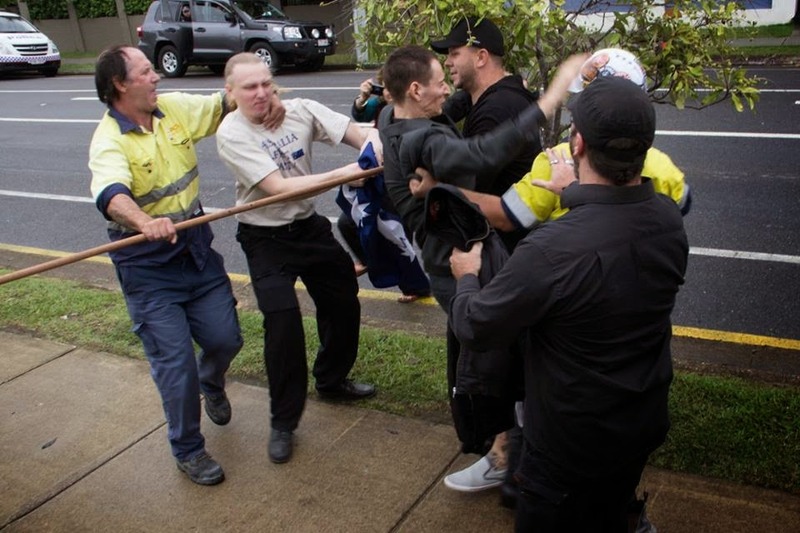 CFMEU thugs attack citizens legally demonstrating in Brisbane. Luke Collier is in the black cap. Well its a long time coming and certainly just the start. But at long last we can announce that State Authorities have charged two of the biggest losers ever to disgrace the CFMEU. No amount of denials from Andy Fleming and Antifa will cover this up. No need to have a fund raiser for this lot Andy, your mates in the ALP and average Joe's union fees will be enough for now. As we see once again antifa thugs sponsored unwittingly by the working class they are trying to destroy. Quick background. Back on the first of May 2014 members from the Australia First Party Brisbane and supporters of the Greek Golden Dawn Party held a small protest in Brisbane. The protest was to bring attention to the politically motivated arrests of the Golden Dawn Leadership in Greece and bring attention to the political motivated murders carried out against Golden Dawn by antifascists in Greece. In an attempt to shut down the legal protest and registered street march by Golden Dawn Supporters and Australia First. Antifa, organised from Melbourne by Andy Fleming, along with members from Brisbane's Refugee Action Collective, contacted their mates at the CFMEU asking them to bust it up. What transpired on the day is well recorded. Twenty Golden Dawn supporters took on 20-25 antifa and an estimated 150 Union members and delegates from the CFMEU and the ETU. It was alleged that the delegates and officials in an attempt to inspire as much hatred towards the GD supporters as possible, told the workers from the surrounding building sites a host of lies. These lies included that they supported the corrupted and out of control LNP State Government at that time. One massive lie after another, as is always the case from these desperate traitors. Outnumbered but not defeated clashes soon broke out. Resulting on the day in the theft of two flags and various assaults causing injury to a few members of Australia First. All the assaults having been instigated by two loud mouth wankers who just so happened to represent the CFMEU and known to Andy Fleming. After the demo these two CFMEU officials were then involved in the cowardly and unprovoked attack upon a small handful of GD members and AF members at a pub on the outskirts of Brisbane City. This resulted in the hospitalization of a 66 year old Greek man who was king hit from behind with knuckle dusters and then repeatedly kicked while on the ground. Unfortunately for the Marxist scum from the CFMEU it was all caught on CTV. 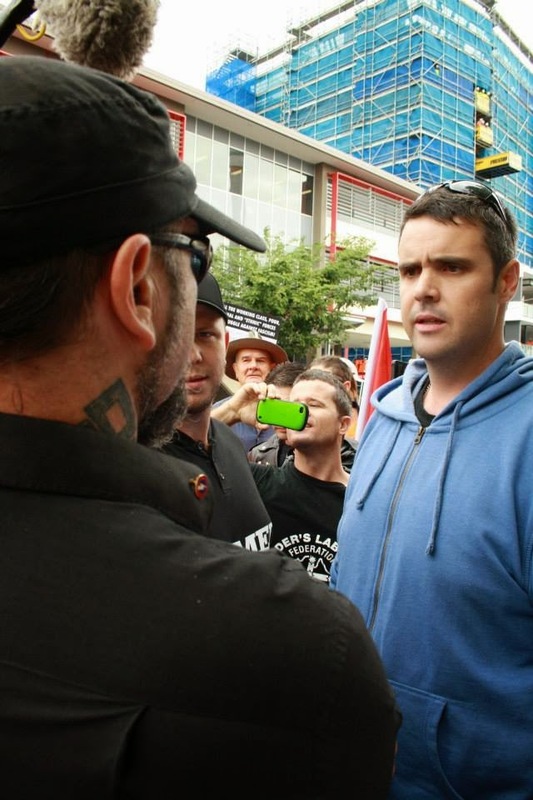 So its with great pleasure to tell you dear readers that the two instigators from the CFMEU Luke Collier and Joe Myles have been formerly charged with assault. Witnesses have been advised to make themselves available for court dates. Luke Collier pictured with stolen goods. All this on top of some rather larger investigations involving both these scum bags along with the another lot of scum bags the Australian Labor Party. Does make you wonder. The ALP, The Greens and Australian Unions continual association with known Marxists, Anarchists and Antifa should have alarm bells ringing. Political persecution union thuggery actual acts of violence and intimidation. Not to mention the destruction of public and private property by these scum. All tools of the seemingly shadow Marxist Government that is protecting and supporting these radical Ultra Left Wing Socialists. Enough is enough they must be exposed and shown the full weight of the law before its to late. Further reading of the hired ALP, Antifa enforcers. 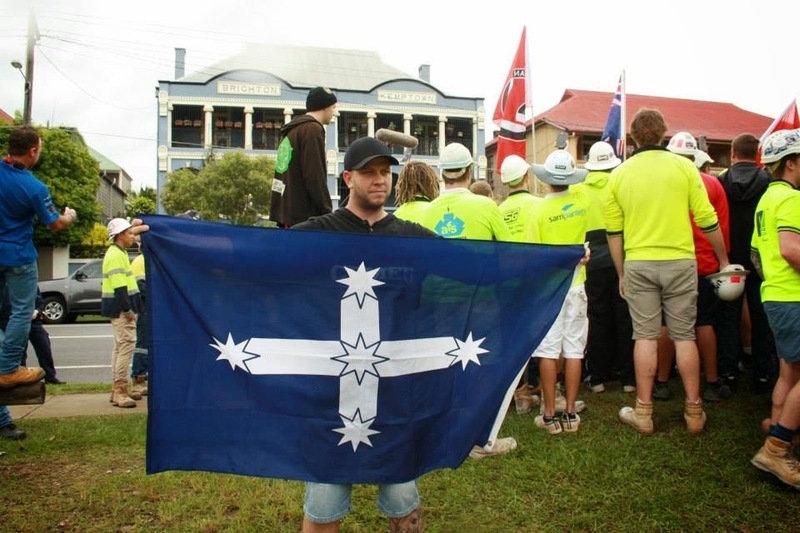 Mar 17, 2015 - Construction, Forestry, Mining and Energy Union organiser Luke Collier allegedly told workers on the Redfern project to stop a concrete pour ..
UPF Wrap Up From July 18 protest. Making A Silk Purse From A Pigs Ear, Literally. July 18 After Action Report. Anti Racist Hypocrites and Pedos. Repost. The Coalition of the Commissars.